Get it while it’s hot: the 2012 Jeep Grand Cherokee SRT! The all – new 2012 Jeep Grand Cherokee SRT is irrefutably the swiftest and most powerful jeep that the industry would ever have in the days to come. This jeep boasts a muscular look illustrating its aggressiveness on the road and ability to withstand the various road conditions that bog down other car models. The jeep which boasts a lowered profile comes with 20-inch alloy wheels and other generous design features that complement the race-inspired interior. The 2012 Jeep Grand Cherokee SRT is one jeep that any car driver would prefer either for purchase or lease for its best handling and engaging ride courtesy of its Active Adaptive damping suspension. The jeep’s Selec-Track traction control facility and the superior Brembo brakes work in synergy to guarantee the buyers of this model, the most engaging experience. This brilliant SRT boasts unmatched class of standard equipment in the industry and its Adaptive Cruise Control system, Uconnect Navigation, Blind-Spot detection and Forward Collision Warning are obvious pointers to this. The Jeep Grand Cherokee SRT treats its buyers to exclusive styling, practicality, on and off-road capability, high-performance equipment among many other exceptional features. The Chrysler’s sporty appeal has beguiled the hearts of many car buyers in the industry who have opted for its lease or purchase. For world-class braking, spectacular ride and handling, muscular stance and sporty outlook, a purchase of this jeep would be a natural justice to any car driver. With the majestic V8 HEMI engine, this SRT model delivers benchmark performance and other state-of-the-art features that no other jeep promises in the auto industry. This 2012 Jeep Grand Cherokee SRT goes for £58,995 OTR. Looking at the functionality that comes with this jeep, the price is worth incurring. The jeep delivers amazing performance and value for money. Take advantage of this jeep’s power on the road by placing an order today. If you’re looking to purchase or lease a new Chrysler contact our sales team. Alternatively, visit our website where you will find new and used Chrysler’s available for sale or on finance. 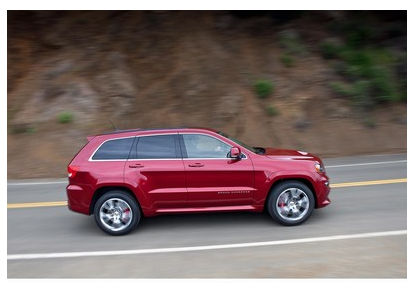 Get it now- the 2012 Jeep Grand Cherokee SRT!